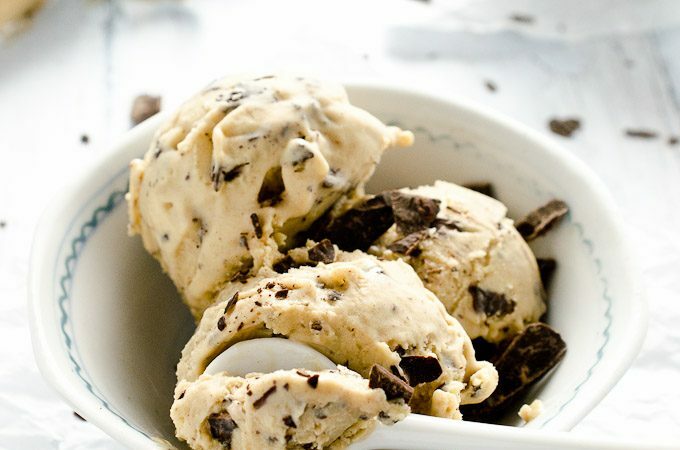 Peanut Butter Banana Ice Cream is the best healthy, dairy-free ice cream around. It's made with only 3 ingredients and you probably have all of them in your kitchen right now. Go on, you know you want to make this! We took a hike last week up Elk Ridge. It meant having to get in the truck and drive to the ‘burbs, that place that looks like every other place in North America with its identical light pink houses, strip malls and minivans. If it weren't for my handsome man's daughter living there, it's a place I'd never visit. Thinking about it I don't actually think anyone ‘visits' the ‘burbs. If you keep driving long enough, you eventually get past the house farms and big box stores and into the countryside. I like the countryside. I've always been a person who likes extremes: city life or country living I can do; that middle ground would kill me. Before putting on our hiking shoes (or in my case flip-flops – which won me the award of “Worst Footwear” by one hiker – the same hiker we ran past on our way down the mountain, thank you very much) we stopped at one of those sprawling big box stores that never fail to make me anxious when I have to go into one. Just about the only thing that will make me feel a tiny little bit better under those harsh fluorescent lights are the rows and rows of bulk bins filled with every kind of imaginable junk food. Or rather, the two treats that take me back to being eight years old: banana chips and Reece's peanut butter candies. Were you wondering where this hiking story was going and how the heck it related to peanut butter banana ice cream? This ice cream was born once the candies disappeared, and my adult sensibilities kicked back in. Sure, it's healthy, but you'd never know it. On your tongue, it will feel just like soft serve ice cream but taste like a peanut butter banana sandwich with honey drizzled on top. I don't care whether you're a kid, a kid at heart or a full-fledged adult, you're going to love this treat. Place the bananas in your food processor or high-powered blender. Blend on high, scraping down the edges, until the ice cream is very creamy, about 2-3 minutes. Add the peanut butter and blend till combined. *If you eat a paleo diet, or just want to switch things up, you can sub almond butter for an equally delicious treat. What are the nutrition facts if you omit the chocolate chips? I just whipped up half a batch to try and it is amazing.. Thanks for the great recipe. Now to hide it in the back of the freezer! Hahaha that’s how I feel when I make it!! Anyone would die to try this peanut butter ice cream! It looks delicious and will surely satisfy your taste buds. how long will this ice cream stay good if in the freezer? I love the peanut butter and banana combo. And that it only has 3 ingredients! The chocolate chips are totally necessary for me! I need this ice cream in my life! This is one of my favorite smmer treats to make! SOOO good! Love your photos. Love the ease of making this but enjoyed eating it more. Thanks! Will be happy to join in for more of your receipes.